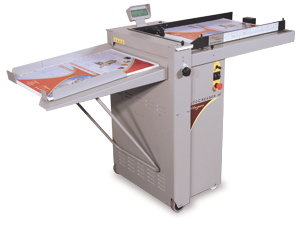 The Autocreaser 50 is capable of creasing sheet sizes to a maximum of 27" x 19.7" and weights in excess of 120 lb+. The minimum sheet size when in automatic mode is 5.5" x 6.3" with up to 15 creases being able to be programmed to a single sheet. Minimum distance between creases is 0.2" with 0.003" micro adjustments to the crease. The Autocreaser 50 has nine memory locations for storing jobs. The blade and anvil are mechanically controlled over the entire length and can be adjusted to accomodate various weights of media.